It's fair to say I am candle obsessed!! My candles of choice are the Bath And Body Works ones-they're relatively inexpensive and the throw is incredible. 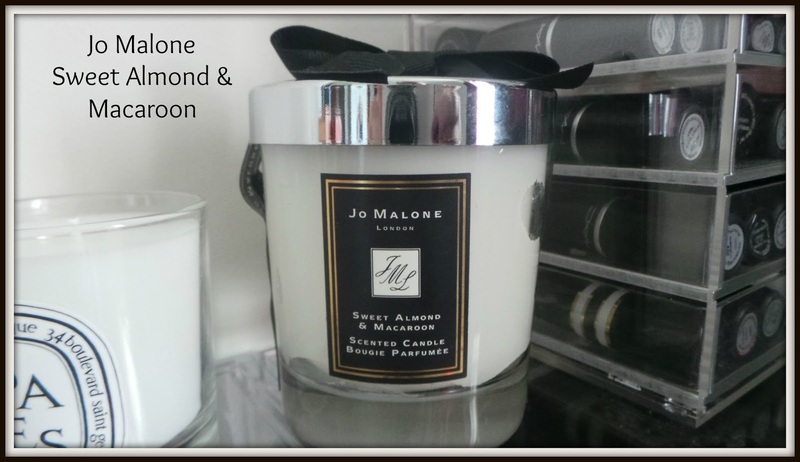 Despite owning several (I think it's double digits) Jo Malone fragrances I have never had any of her candles....until now! When I read about the 'Just Like Sunday' candle collection launching, I knew immediately that Sweet Almond and Macaroon would be up my street. The other 3 candles, 'Lavender and Lovage', 'Green Tomato Leaf' and 'Incense and Embers' didn't immediately call out 'buy buy buy' to me as Sweet Almond and Macaroon did. And it doesn't disappoint. It smells like walking into Laudurée, the famous macaroon bakery. Sweet without being sickly with hints of cherry, vanilla and coconut. A far cry from the headiness of all the Christmas candles I have been burning since November. It's time to pack away the Frosted Gingerbread, the Merry Cookie and the Nutmeg and Spice and embrace the lighter, sweeter scent of the coming Spring. As with all Jo Malone products, it's not cheap-retailing at £39 in the UK or $65 in the US-but I still think this limited edition will fly off the shelves. It's already sold out in Nordstrom where I purchased mine from. Do you find this collection tempting?